Play On: Navy Midshipmen +3. The Navy Midshipmen have really impressed me this season. Their 7-5 record just doesn’t do them much justice. Obviously five losses is a lot, but when you consider that all five of those losses came against bowl teams, it’s forgivable. Their five losses have come to Ohio State, Rutgers, Western Kentucky, Air Force and Notre Dame with four of them coming by 10 points or less. The lone exception was a 17-34 loss to Ohio State in the opener, but that was a close game until the fourth quarter as the Buckeyes pulled away late. Well, Ohio State is playing in the four-team playoff, so that’s not a bad loss at all. The Midshipmen did hit a rough patch with three straight losses in the middle of the season, but they have been playing tremendous football down the stretch. Navy is 5-1 in its last six games overall with its only loss coming to Notre Dame 39-49 as a 14-point underdog. It beat a very good Georgia Southern team that went 8-0 in the Sun Belt 52-19 as a 3-point home favorite. It went on the road and beat another bowl team in South Alabama 42-40 to become bowl eligible as well. The 17-10 win over Army wasn’t that impressive, but the Black Knights tend to play them tough more times than not in that rivalry game. Plus, it was a letdown spot for them having won 12 in a row over Army coming in, and just becoming bowl eligible the game prior. San Diego State has not impressed me nearly as much as in year’s past. It does have an identical 7-5 record to Navy, but when you look at who it has beaten, you find that it has taken advantage of soft schedule. SDSU’s seven wins have come against Northern Arizona, UNLV, New Mexico, Hawaii, Idaho, Air Force and San Jose State. Only one of those teams (Air Force) has a winning record this year. UNLV, New Mexico, Hawaii, Idaho and SJSU have a combined 14-47 record, and Northern Arizona is an FCS opponent. The Aztecs are only 1-4 against bowl teams this season. They have ugly losses to Oregon State (7-28), Fresno State (13-24) and Nevada (14-30) among their worst defeats. Obviously, Navy is another bowl team, and based on that record against them the Aztecs have no business being favored here. The only reason they are is because this is a home game for them in San Diego, because they clearly aren’t the better team. The Midshipmen have a huge edge on offense in this one. They are scoring 33.1 points per game, averaging 431.7 yards per game and 6.5 per play against teams that give up 29.2 points, 409 yards per game and 5.8 per play. The Aztecs are scoring just 25.7 points per game and averaging 400.1 yards per game against teams that give up 32.3 points and 437 yards per game. 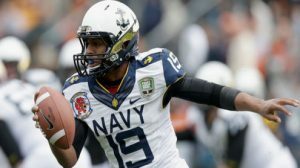 Keenan Reynolds is one of the best players in all of college football, and certainly the best triple-option quarterback that Navy has ever had. Reynolds has rushed for 1,182 yards and 21 touchdowns while averaging 5.1 per carry this season. He is also a threat in the passing game, averaging 7.9 yards per attempt with six touchdowns against three interceptions. It’s not usually a wise move to go against Reynolds and these Midshipmen as underdogs. Navy is 54-20 ATS in its last 74 games as a road underdog. The Midshipmen are 10-2 ATS in their last 12 road games as an underdog of 3 points or less. San Diego State is 1-9 ATS in its last 10 home games after gaining 275 or more rushing yards in its last game. The Aztecs are 1-10 ATS in their last 11 games following three or more consecutive ATS wins. The Midshipmen are 18-5 ATS in their last 23 vs. MWC opponents. Plays on road teams where the line is +3 to -3 (NAVY) – off one or more consecutive unders, good offensive team – scoring 31 or more points/game are 75-30 (71.4%) ATS over the last five seasons. Navy is 42-21 ATS in its last 63 vs. good rushing teams that average 200 or more rushing yards per game. San Diego State is 10-22 ATS in its last 32 home games vs. good offensive teams that average at least 5.9 yards per play. Bet Navy in the Poinsettia Bowl Tuesday. No. 3 Ranked Overall Handicapper in 2014! Jack Jones and his $1,000/game players have cashed in a WHOPPING $76,300 this year in all sports! He has delivered 12 winning cards L15 days capped off by a HOT 15-5 Run L3 Days! He has a couple of great long-term streaks in play today! Get Jack’s Tuesday 3-Play Power Pack for $49.95 and hop on board his 914-730 Basketball & 213-156 NCAAF Runs! Leading the charge is his 20* NIU/Marshall Boca Raton Bowl No-Brainer on the college gridiron! You’ll also receive his 15* CBB Undervalued Underdog along with his 15* NBA No-Doubt Rout on the hardwood! You are GUARANTEED PROFITS or Wednesday’s entire card is ON JACK!